"And lo, a man became 'hyped' for a video game, and then had his spirits dampened upon seeing the first trailer." Okay, yes, I'm feeling a bit bummed today. That's because there's finally a Star Wars Battlefront trailer and...well, we'll discuss that more in a bit. Also, Dying Light gets mod tools, Project CARS runs in 12K, and Abe's Exoddus will receive an HD remake—this is gaming news for the week of April 13. Well, that new Battlefront game certainly sounds like a reskinned Battlefield, if IGN's preview coverage is anything to go by. I mean, no space battles? Only four locations? Ugh. 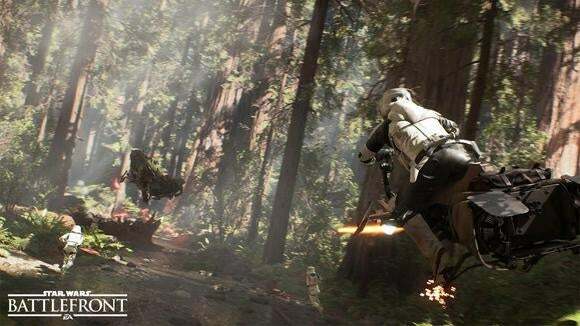 I'm way less excited than I was before, though at least DICE confirmed there's a third-person view. There are so many Humble Bundles at this point, I've kind of given up on doing weekly coverage. However, this week's Humble Origin Bundle 2 is a real doozy if you've missed any EA games in the past five or so years—Dragon Age: Origins, Peggle, Dead Space 2, Medal of Honor Allied Assault: War Chest, and Command & Conquer Assault are all in the "pay what you want" tier, which is a hell of a value. And if you pay more than the average—currently sitting at $4.93—you'll also receive Bejeweled 3, Dragon Age II, Mass Effect 2, Plants Vs. Zombies Garden Warfare, and presumably a few more games added next week. It's a good week for PC mods, and not just because Grand Theft Auto V released. Techland added official mod tools to its zombie/parkour game Dying Light. Want to watch a zombie get kicked off a cliff onto a giant bullseye target? One of these days we'll get a new Oddworld game. In the meantime, I guess we're going to slowly get remakes of the entire catalogue. Following the recent release of Oddworld: New 'n' Tasty (a remake of Abe's Oddysee), Lorne Lanning has confirmed developer Just Add Water is now early in production on an HD remake of Abe's Exoddus (via /r/games). Forget 4K. What about 12K? In keeping with its studio name, this week Slightly Mad Studios announced by way of an FAQ that you can run the upcoming Project CARS at 12K resolution. TWELVE. And here I am just playing games at 1080p like some sort of luddite. After initial reports by Kotaku Australia, 2K announced this week that it's shuttering Borderlands: The Pre-Sequel developer 2K Australia, reportedly to "better manage ongoing development costs while improving the working proximity of our creative teams." It's a pretty big blow, considering there aren't exactly a flood of AAA dev studios in Australia. Here's hoping we see a bunch of fantastic indie games from that region soon, if nothing else. Also in closure news: EA is killing off a handful of free-to-play games. If you're a fan of Need for Speed World, Battlefield Heroes, Battlefield Play4Free, or FIFA World, get it out of your system now. Battlefield Heroes is closing down permanently in July, and I'd expect the others to go offline around the same time. These closures are sad because of the waste of potential more than anything else. Both Need for Speed World and Battlefield Heroes were potentially great free-to-play games killed off in part by EA's neglect—cheating was rampant, which gave both games a bad rap. Ah well. At least they paved the way for a new generation of better/deeper free-to-play games, like Path of Exile and Insurgency. Other free-to-play games are not so great. This week, Total War Battles: Kingdom popped up on Steam and it is very much a free-to-play game i.e. everything takes hours to build and is basically as tedious as possible to convince you to spend money. The first time I demoed the game it was on a tablet, which seems like a more appropriate environment. Personally I don't need to wait eight hours to harvest wheat though. I mean, come on—Hearthstone is on phones now. I think we can all agree the best Google Doodles are the ones that are super-simple and yet incredibly addictive games, like this one celebrating the 155th anniversary of the Pony Express this week. Need a way to waste your entire Friday at work? You're welcome. Remember when mini-golf games were all the rage? How about steampunk? Okay, well what if...what if you combined the two sort-of played-out concepts into something weird and crazy? I'd pretty much forgotten Epic was working on Fortnite. It's been years now, and aside from a rush of news last summer things have been pretty quiet. Well taking some cues from the current open-development Unreal Tournament team, it seems the Fortnite team has started doing lengthy livestreams of the game (via VG24/7). This week they did almost an hour talking about the game's weapons and traps, if you're interested. To be honest, I've been too busy playing Mortal Kombat X to write very much this week. Because Mortal Kombat X is fantastic. Similarly fantastic? Grand Theft Auto V on PC. And the community already added Oculus Rift support. Dead Synchronicity is also pretty good, except for the ending! Got some non-Steam games you want to play in your living room or on your phone? Stream What You Own wants to help. Razer's RGB keyboards go tenkeyless. And finally, we discuss why Nvidia graphics cards are bad for open source, but still good for Linux gaming.